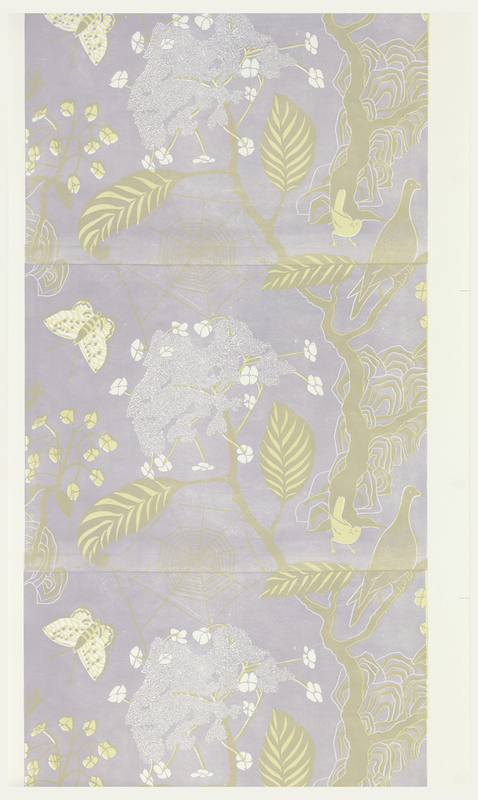 When describing wallpaper, Marthe Armitage, the designer of this paper, has said “Wallpaper… should be seen and not heard. It should provide a background in a home, and should not make you feel you have to look at it all the time.” While the color pallet of this sidewall is soft and easy on the eyes, with its light purple and yellow tones, it certainly doesn’t blend into the background. Delicate white flowers, lacy depictions of cobwebs, and a network of scraggly branches guide the eye across the surface of the wallpaper, allowing the observant viewer to pick out the gliding butterflies and perched birds throughout the composition. Known for her depictions of natural elements and landscapes, Armitage aptly cites her major influences as gardens, plants, and books containing scenes of nature. Her designs have been likened to English designers A.W.N. Pugin and William Morris who are also major influences for her work. Marthe Armitage is an English artist and designer who was born in 1930 to Dutch parents. While she studied at the Chelsea School of Art and graduated in the 1940s, she didn’t start her career in the arts until later in life. During a short stint of living in India with her husband and children, she became interested in the method of block printing after seeing the textiles being produced at her local bazar. Sometime after this she purchased her own lithographic printing press and began printing wallpaper herself. Over the course of her career she has been featured in multiple exhibitions and was the Master of the Art Workers’ Guild, of which she is still currently a member. Her work has been documented by the BBC and used on set for Hollywood productions, notably 2012’s “The Women in Black.” Today she continues to live and print wallpaper in England. I don’t understand the meaning of your title “Out of the Cobwebs”? There have never been any cobwebs around this woman.